This book was the worst. One of the library patrons pointed it out to be because she noticed that Bandelier was spelled Bandolier. After looking through the rest of the book I can't believe that no one has called this book to my attention before. There is so much misinformation in this book I don't know where to begin. The whole tenor of the book makes New Mexico sound like a third world country populated by savages. 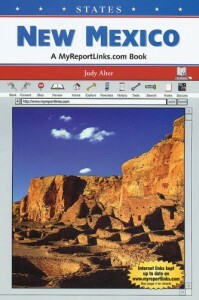 There is bad information on tribal government, Maria Martinez, and even the pictures included in the book are wrongly referred to as New Mexico, when they are really pictures of Arizona. I can't wait until all copies of this book are pulled from our shelves, and I will NOT be reccomending this company to parents and teachers.